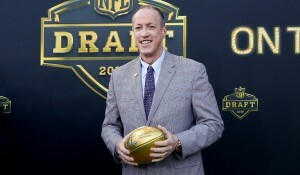 Buffalo Bills legend Jim Kelly will be traveling to Corning this spring to be the keynote speaker for the fundraiser being put on by Pathways, Inc. on May 14. The organization specializes in assisting programs that help children with mental health issues, developmental disabilities, and being taken care of in foster care or daycare. Tickets for the event will be $75 per person or $750 to reserve a table for 10, however there will also be balcony seats available for sale for $30 each. Everyone should expect to be at the Corning Museum of Glass Auditorium by 8 p.m., and beverages will be served at a cash bar that everyone can have access to. Kelly is expected to tell stories about his career playing football with the Bills, including how the team got to four consecutive Super Bowls and lost all of them to their opponents. The East Brady, Pennsylvania native was selected to play for the team after his USFL team, the Houston Gamblers, folded their franchise. From there he led the Bills to between the years of 1988 and 1995 and finished his career with over 35,000 yards thrown on the field for the NFL. The four-time AFC champion also had his number 12 jersey retired from the Buffalo team, which is the only time that the franchise has ever done the in their history. In addition to that, Kelly is the only quarterback in NFL history to bring his team to four consecutive Super Bowls even though they did not win any of them. Kelly will be attending as the keynote speaker to this year’s fundraiser to benefit Pathways, Inc. this coming Spring in Corning. The event should be a lot of fun and hopefully be able to bring in some funds to help the local youth assistant programs. If your company is interested in finding out availability and booking fees for a former professional football player like Jim Kelly or other sports celebrities for an Keynote Speech, Charity Event, Guest Appearance, or Football Camp, call us at 1-888-246-7141.